One of the known names in the cheese industries, Henri Willig Cheese & More has been wide spreading since its origin in 1974 and currently occupies a fair share of the market and people’s heart in more than 30 countries! The founder of the company- Henri Willig was born in a family of dairy farm worker and was highly influenced by it, hence when he and his wife Riet decided to put their efforts in the business, it all but flourished. 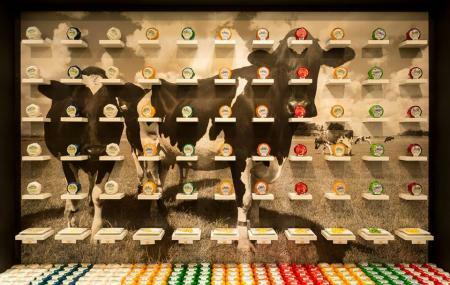 Today, the man’s legacy has created a range of Dutch cheese specialties, from goat’s cheese, sheep’s cheese to what not, all made organically by their own unique recipes. As tourists visiting the city, it is something not to be missed and don’t worry, you will find many of branches lying just around the corner. Hence, ensure to stop by in this amazing paradise of cheese and have some dig into some of those delicious lip-smacking goodness! There are many stores of the same franchise hence it is better to find the one that is nearby. Contact the authority if needed. Sweet-smelling cheese shop with delicious Gouda cheese. Very professional and kind staff which will help you with correct choice. You can also taste various types of Gouda cheese. I am for classic - Baby Gouda. Super friendly staff, very helpful. A good variety. Maybe a tad expensive, but that's the same in all cheese place in Amsterdam. Amazing shop. I always buy this cheese when I visit 'Dam. Green pesto, truffle & coconut are my favourite. You can taste the product here before you buy. Easy & safe to carry back to your country as the cheese is safe unrefrigerated for up to one month unopened. Lovely cheese board gifts. They also sell some meats & pickles. Friendly and knowledgeable staff especially the tall man with the beard. Make sure you visit this shop. This place has many kinds of cheese which are delicious and can be tasted. Also there are plenty of mustards like honey mustard. And at least if you found more than one cheese there are offers where you get it cheaper. I recommend the chili cheese, you really need to try it.